There are so many things I am loving this summer. I am forever finding myself wishing there were more meals in the day just so I could have more opportunities to eat watermelon, bruschetta, and grilled vegetables. Truth be told, I do a bit more than wish at times. I have no problem making a few extra trips to the fridge throughout the day just so I can fully enjoy all of the wonderful summer bounty. While many of our sides consist of fresh fruit and garlic crostini right now, these fries (...oh, these fries...) have become a favorite and are appearing increasingly often on weeknights here at Norwyk Manor. 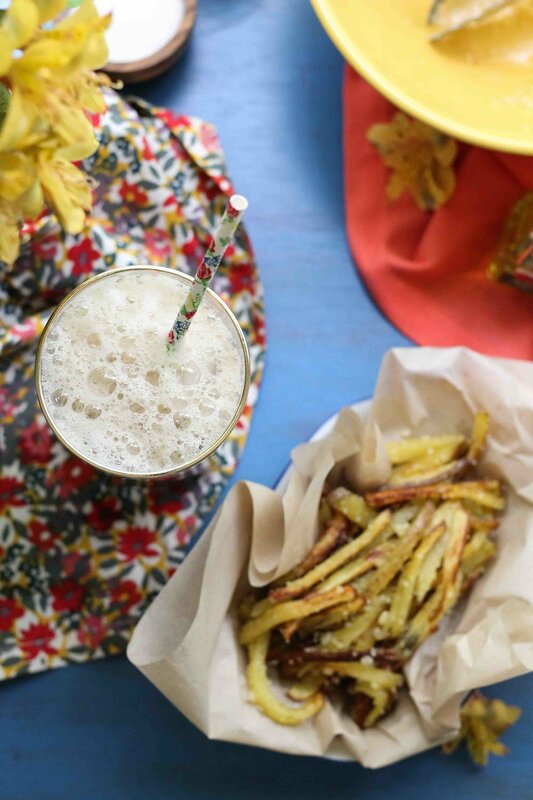 I love these fries first, because they are absolutely delicious, and second, because they are so easy to make on a weeknight and I love the fact that I do not have to mess with a pot of hot oil. I do not mind frying, except when I do. Oh, and third? Truffle oil. Do I really need to say anything else? I had tried oven fries many times before, but I always looked at them, or their server, with an inner raised eyebrow/eye roll of skepticism and my inner dialogue went something like, "Oh really? You cannot even tell the difference? I bet you are going to try to serve me black bean brownies too, aren't ya? Pssh...tricky trickster alert." I have no grandiose hopes of convincing you that these baked fries are remarkably identical to fried fries because, well these aren't fried! My current philosophy is that in order to enjoy an oven fry, you have to expect an oven fry, not a fast food fry. Are we clear? Oven fries can be truly delicious, as long as we do not suppose them to be something they are not. Now that full disclosure has been given, I will boast that these fries are the very best, crispest, and fry-like oven fries I have ever had. I mean, they are really, really good, and that is not just because of the parm and truffle oil, though goodness knows it doesn't hurt. Sometimes I have very wicked dreams of pouring myself a very cold root beer and eating the entire pan of fries by myself. Okay, maybe it is more than a dream...but these are the things that happen when I am left to do photoshoots alone. Let's call it "testing." These fries are my new go-to side for burgers, steaks, and pretty much everything else. Cook’s Note: I love using yukon gold potatoes because they are just slightly sweet and we do not have to bother about peeling! Cut potatoes into thin sticks. We are aiming for 1/4-inch in thickness. Rinse the fries under cold water and pat dry with a tea towel, removing as much water as you can. Place the fries evenly onto two baking sheets, allowing a bit of space between each fry so that the edges can brown. Drizzle each pan with 2 tablespoons of olive oil and salt liberally. Cook’s Note: If you cannot fit both baking sheets in your oven side-by-side, just place one pan on the lower rack and rotate the pans every 10 minutes or so. Bake on the top rack of your oven for 25-30 minutes, or until the fries are evenly browned and crisp. 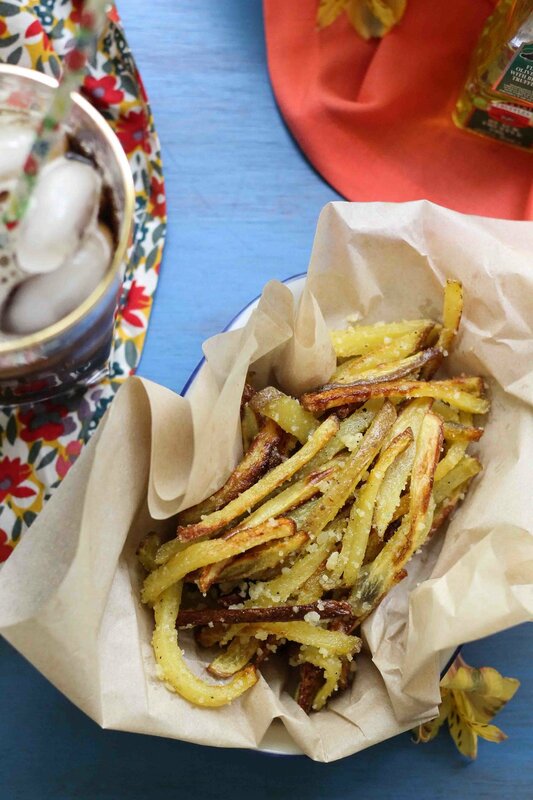 Transfer the fries to a large bowl and toss with parmesan, truffle oil, and black pepper. Serve immediately. Enjoy!